Staying at some small hotels is like staying at the home of a close and dear friend; the Hotel Eden au Lac is one of them. 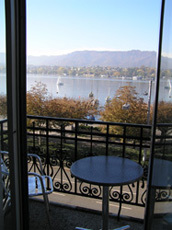 The art nouveau hotel is located on the shore of Lake Zurich and has a prestigious Utoquai address. The Hotel Eden au Lac's décor features marble floors, soaring ceilings with sparkling crystal chandeliers, antiques from the home of the former owner, and an impressive art collection throughout the hotel and the guestrooms. 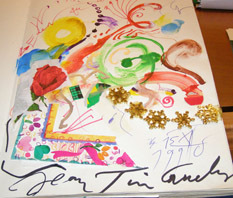 The collection consists of original lithographs from many well-known artists including works from Jean Tinguely, Paul Leber, and Viennese artist Alfred Hofkunst who was a frequent guest. Their guestbook is an impressive list of "Who's Who," of guests who stayed at the Hotel Eden au Lac and continue to return to this charming hotel. If the hotel has a comfortable homey ambience, perhaps it is because Katherin Fumagalli, daughter of the former owner, grew up at the hotel, and together with her husband, Dario Fumagalli, they are the perfect hosts and managers who ensure each guest's satisfaction. Edward F. Nesta and I stayed at the Hotel Eden au Lac in October 2006 and had enjoyed gastronomic dinners at their 14 points GaultMillau Restaurant Eden where French Executive Chef Ludovic Pitrel puts his creative culinary stamp on their excellent menu. A few selections that we sampled included King Prawns with Sherry Vinegar Sauce, Red Mullet with Bouillabaisse Sauce, and Mignon de boeuf Helder. The chef's artistry was definitely apparent in his inspired desserts, which included Quince-Pumpkin Mille-Feuille with Five-Spices and Olive Oil Ice Cream, Cotton Candy, and Coconut Saffron cookies, that really demonstrate the chef's use of North Africa and Moroccan herbs, spices, and oils. Small in stature, but large in heart, the hotel features exciting Jazz evenings every Thursday and Friday from October - May, which we had the opportunity to experience during our stay at the hotel. 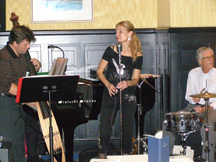 Rebecca Spiteri & the Rolf Lyssy Trio kept the atmosphere lively for the appreciative patrons in the cozy Eden Bar with classic songs, "Stella by Starlight", "God Bless the Child", "You Can't Take That Away from Me" and "Devil May Care." The hotel takes full advantage of their Lake Zurich location with their "Top of the Eden" rooftop terrace where guests can sit at the tables and enjoy the lake, Alps, and city views in the early morning, and impressive sunsets and sparkling city lights in the evening. Fitness enthusiasts will enjoy jogging along Lake Zurich, followed by a private sauna on the fifth floor when they return to the hotel. Opera lovers will appreciate the hotel's close proximity to the Zurich Opera House, and shoppers will enjoy the short walk to the city center. 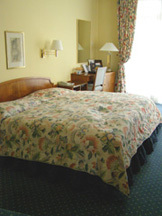 Our corner guestroom faced Lake Zurich and featured a king bed in a floral bedspread flanked by two nightstands. Matching floor to ceiling window treatments framed the French doors leading to two wrought-iron balconies where we enjoyed sitting and reading the morning newspaper. The room's comfortable ambience also included two blue and yellow plaid upholstered wingback chairs beside a glass and brass round table laden with a bowl of an enticing mix of fresh fruit, and an original gold-framed Degas lithograph on the wall. The mirrored armoire had a large safe, and held robes and slippers, there was a mini-bar by the desk, and there was a Philips satellite television. Although the hotel has many antiques, they have a keen eye when it comes to the modern technology needs of travelers and have high-speed Internet connection, and Wireless LAN access throughout the hotel. Our large bathroom featured a large silver mirror over the spacious vanity with double sinks, a combination tub/shower, scale, hairdryer, stool, and an assortment of thoughtful Eden au Lac amenities. The Hotel Eden au Lac provides excellent service in an elegant setting, and when you return, you feel like you are coming home. Read additional articles on the Hotel Eden au Lac in the Restaurants and Chefs' Recipes sections where Executive Chef Ludovic Pitrel of the Restaurant Eden shares a few of his creative recipes. The Hotel Eden au Lac is part of the Victoria-Jungfrau Collection, www.Victoria-Jungfrau-Collection.ch.